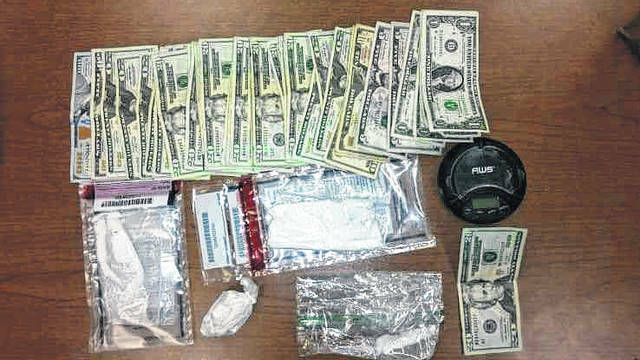 Law enforcement served a search warrant at Vinton Avenue in Gallipolis Tuesday morning, resulting in the discovery of an undisclosed amount of cash and around 50 grams of suspected cocaine. GALLIPOLIS — Gallipolis Police Chief Jeff Boyer released information about a search warrant served Tuesday morning by Gallipolis City Police officers and the Major Crimes Task Force of Gallia and Meigs Counties on Vinton Avenue in Gallipolis that resulted in the arrest of a Dayton man and seizure of suspected cocaine and cash. Boyer stated that after several tips from the public and investigations by the Gallipolis Police Department and the Major Crimes Task Force of Gallia-Meigs Counties with the assistance of Gallia County Prosecutor Jason Holdren, a search warrant was obtained. After securing the Vinton Avenue residence, officers completed a search of the premises. Several items of contraband were seized along with approximately 50 grams of suspected cocaine and an undisclosed amount of cash. The Dayton man has been placed in the Gallia County Jail. The case will be presented to the Gallia County Prosecutors Office for charges and future grand jury considerations. The Major Crimes Task Force of Gallia-Meigs is a state task force under the jurisdiction of the Ohio Organized Crime Investigations Commission which is part of the Ohio Attorney General Office, the task force was formed in September 2013 and consists of the Gallia and Meigs County Sheriff Offices, Ohio Bureau of Criminal Investigation, the Gallipolis City Police Department, the Middleport Police Department and both the Meigs and Gallia County Prosecutor Offices.